Cette adaptation quelque peu bancale du roman de Hunter S. Thompson (FEAR AND LOATHING IN LAS VEGAS) repose sur un scénario anecdotique et superficiel. Des dialogues inspirés rehaussent le niveau de l'ensemble, mais la réalisation incertaine semble incapable d'imposer ton et rythme. Sans parler de succès ou d'échec, le résultat demeure plus qu'honnête, ce qui est déjà beaucoup pour un projet aussi casse-gueule. Si l’on est donc loin du chef d’œuvre, on n’est heureusement pas déçu. The trouble with The Rum Diary, on page and screen, is that it's only a tease, a curio of a time when Thompson wasn't ready yet to rip the world in half and start again. 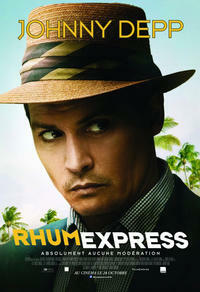 The Rum Diary is a mediocre movie made with the best of intentions. Fréquemment drôle, souvent juste et parfois inspirée, voici une oeuvre qui malheureusement ne tient pas ses promesses et laisse, malgré ses bons coups, l'impression d'une occasion ratée. S’il est loin d’être parfait, il émane néanmoins de ce film un charme très réel, lié sans doute à la grande sincérité des artisans qui l’ont fabriqué. For Depp, this is a welcome return to the rebellious character actor he used to be (long before he became a billion-dollar savior for Disney), and I'd like to see him continue to explore Thompson's work on-screen. He's the perfect surrogate for the man, and there's a lot more material to use. The tale was no doubt meant to convey Kemp/Thompson's boozy aimlessness, but the film feels disjointed and meandering as a result. Against that very busy canvas, Depp quietly paints Kemp's many interior occupations — the journalist observing the scene, taking it all in, ruminating, then struggling to putting it all down in words. It just isn't quite enough to take off the rough edge — for that, I guess, there is always the rum. Robinson adequately captures the stranger-in-a-strange-land mood in the early scenes, but fails to push it to its hallucinatory limits. One gets the sense that he’s tiptoeing around the material, lest he set Thompson spinning in his grave.